Antique sepia tone photograph on thick stock. Captioned "Julie Ady" on front, with company name of Chadbourne, Fond du Lac, Wisconsin. 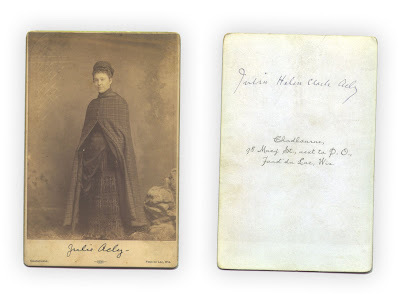 On reverse, full name: Julia Helen Clark Ady. Company name: Charbourne, 98 Macy St, next to P.O. 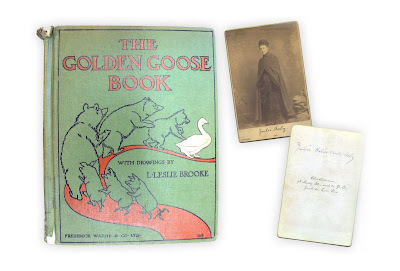 Fond du Lac, Wis.
Found in "The Golden Goose Book," drawings by L. Leslie Brooke. Published by Frederick Warne & Co., 1905.
nice! what year do you think the photograph is from? Even Better. Ms. Julia H C Acly was the headmistress of Saint Margaret's School in Paris; notable attendee who she wrote a report card for herself? Eleanor Butler Alexander, who married Theodore Roosevelt Jr. (son of the former President). As of 1896, the tuition was $1,000 a year. She never married, and is buried near her Reverend father and mother.